Clafoutis (or) Clafouti is a Baked French Fruit based or Dessert traditionally made with Cherries covered a thin pancake like batter. It is a kind of pudding made with Flour or Almond meal and baked till golden brown top and Served warm with powdered sugar on top. It is otherwise called 'Cherry Pudding' or 'Cherry sponge pudding'. It is a seasonal dessert prepared when cherries are in season especially at summer. Super easy baked dessert prepared without much effort. Made with pitted/ cut fresh cherries. I am making this dessert for my Blogs First Anniversary. De seed the cherries by pitting or cutting them by make a slit all around the cherry and twist them and remove the seed using a knife. Break two eggs and beat them using a balloon whisk till fluffy and add sugar and salt mix well. Add the milk and vanilla extract and melted butter; mix well. Mix All purpose flour and corn flour and sift/sieve the flour well to mix evenly. Add the flour mixture a tablespoon at a time and mix well without any lumps. Now the batter will be thin similar like a pan cake batter. Take six small tart tins or two medium sized tart tins and apply butter and add sprinkle some sugar at the bottom as a even layer. Spread the cut cherries evenly and arrange the tart tins in a tray and pour the batter three fourth of the tart tin. 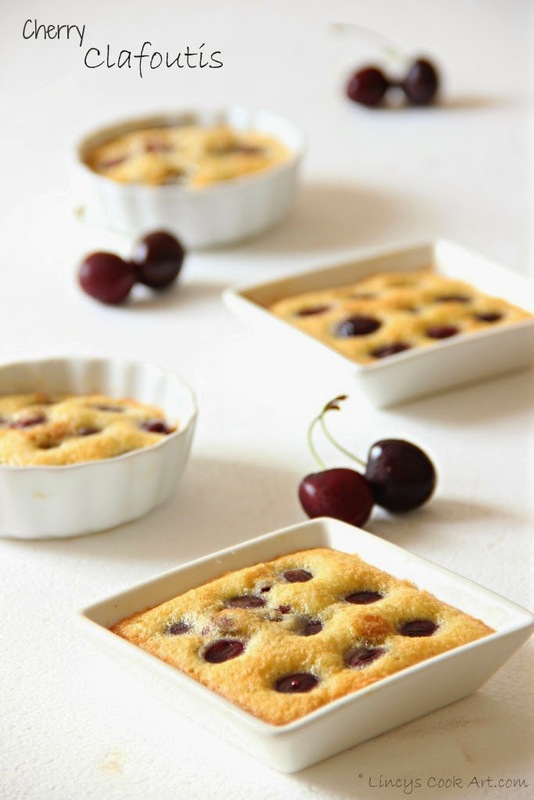 If you use medium or large tins keep the cherries arranged tins inside the oven and pour the batter on top. Bake them on 180 degree till the claufoutis becomes light brown on top around 20 to 25 minutes. Sprinkle some icing sugar on top and serve them warm. Looks absolutely divine....... Inviting and interesting !! 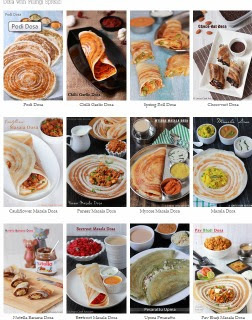 Clafoutis looks delectable and inviting.Nice clicks. Happy anniversay dear! These look so delicious! Oh Lincy you make me drool with your pics....so delicious and beautiful and very neat presentation, can the same pudding be steamed and cooked? You will not get the same taste if you steam it. Because while steaming the top of the batter will not becomes brown and slightly hard to touch instead it becomes soft. Congrats on your blogs first anniversary dear....this cherry clafoutis looks truly divine...The clicks itself tell how great it must have tasted..